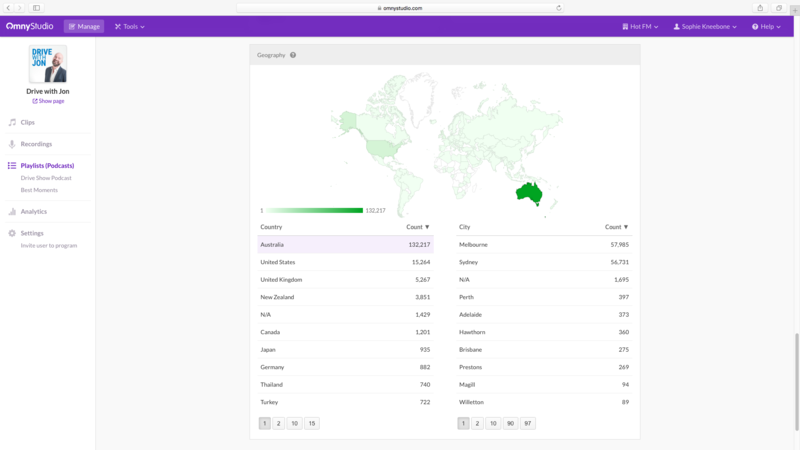 The complete breakdown of how to track your download stats in Omny Studio. Omny Studio is a powerful, multi-functional platform and we track analytics on four levels: organisation-wide, program-wide, per playlist and per clip. 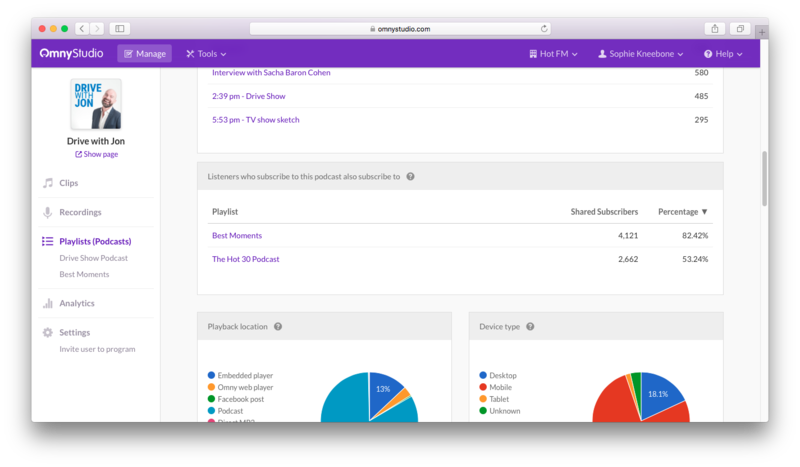 The organisation-wide analytics are for users that have multiple shows, for example, a large podcast network or radio station. This level of analytics shows stats across every episode of every show. Program-wide analytics will get you stats for every piece of audio that’s inside the selected program. 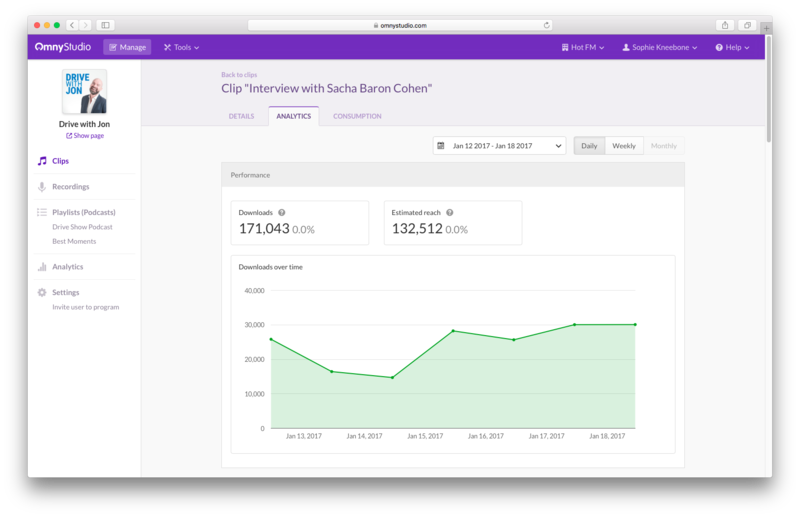 Playlist analytics will show you the stats for the audio inside a particular playlist, and clip analytics will show you - you guessed it - the stats for that clip. 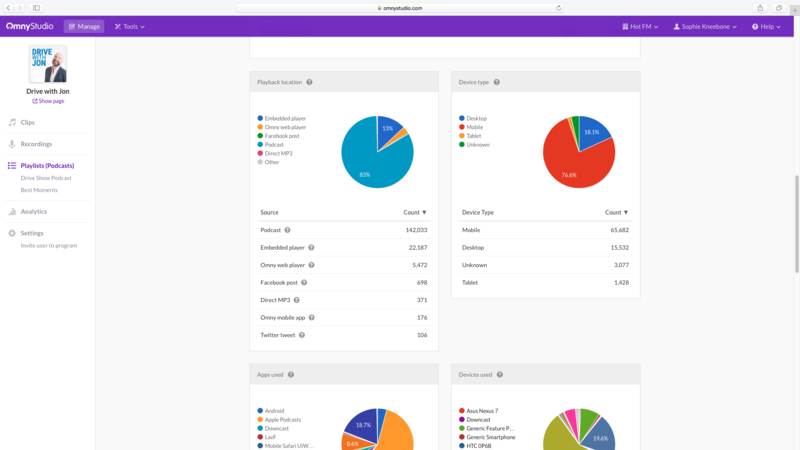 Each analytics section of Omny Studio is laid out in the same basic format. Here is a breakdown of what each part means. Clip downloads: the total number of downloads for every piece of audio in the selected area (organisation, program, playlist or single clip). In this context, “downloads” refers to listens via streaming the audio as well as direct downloads of the MP3 . Subscribers: The average number of people who have subscribed to your podcast feed. For a detailed explanation of how subscriber numbers are counted, click here. Most downloaded: a list of all the audio in the selected area showing the download number for each clip. By default this list is arranged from highest to lowest, but you can change it to lowest to highest by clicking the arrow next to “Downloads”. Listeners who subscribe to this podcast also subscribe to: This section shows you the number of listeners who subscribe to this playlist's podcast feed who have subscribed to other podcasts within your organisation. This information is calculated by inspecting the most recent 24 hours of podcast subscribers. Playback location: How the clip was listened to. 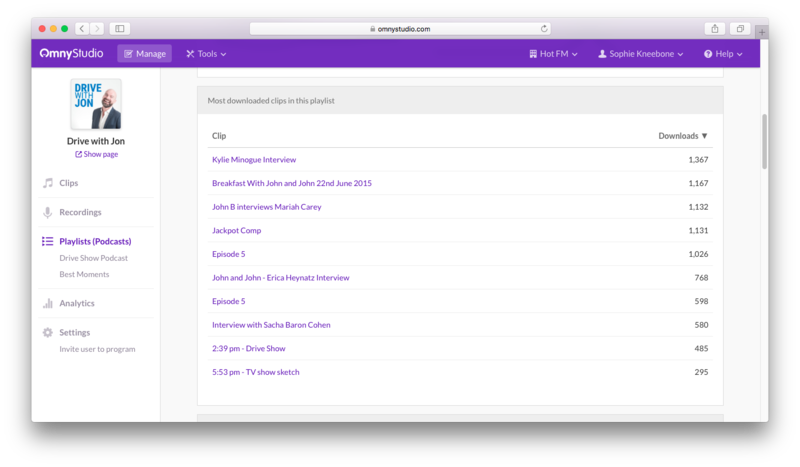 The most common methods are through the podcast feed and an embedded website widget. Device type: what kind of devices were used to listen to the clips, for example, mobile or desktop. Apps used: which apps or directories have been used to listen to your content. This is particularly useful to know because you can organise your content based on what the most popular platforms are among your listeners. 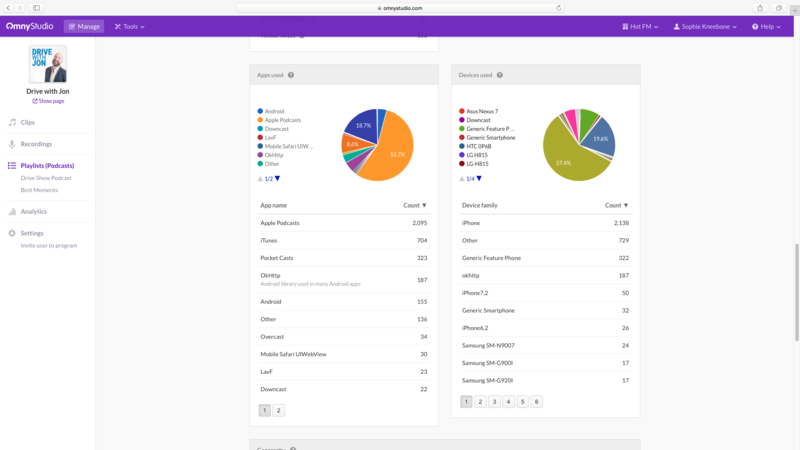 For example, if you’re planning on building a mobile app for your network, you’ll be able to see what percentage of your listeners use Android or iOS. Devices used: What specific devices listeners are using. Listener data such as this is particularly useful when approaching advertisers or sponsors for your podcast. Geography: where in the world people have listened to your content, displayed by country in order of highest to lowest number of listens. Click on the country to see a breakdown of how many listens you've had by city. 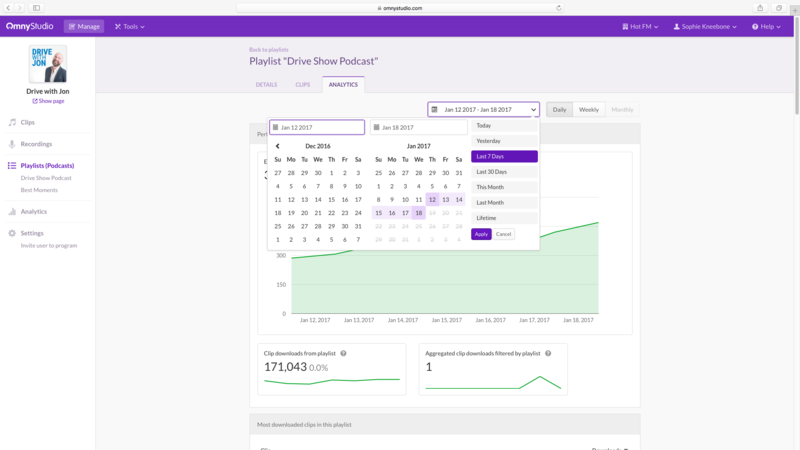 Omny Studio also tracks consumption analytics to show how much of each episode people have listened to, start-at and drop-off times, and where skipping has occurred. Click here for more information about consumption analytics.